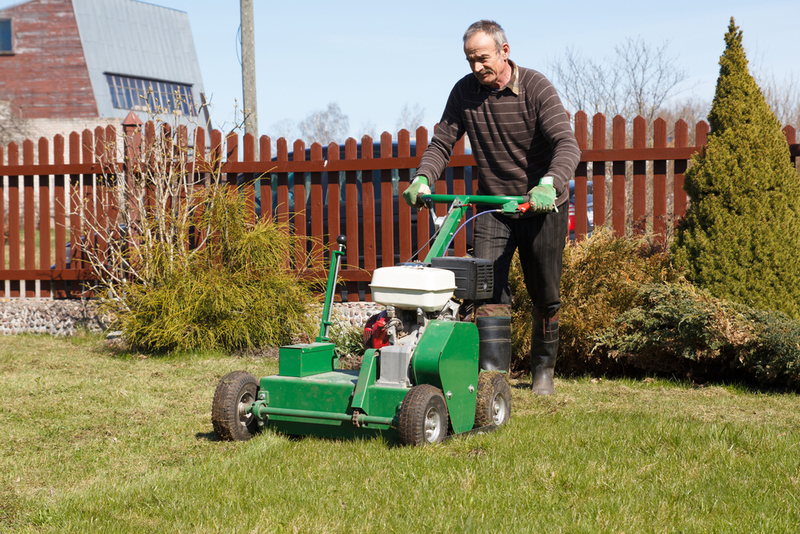 In spring, a young man’s fancy turns lightly toward… lawn aeration. And so should yours! Your lawn, after putting up with your demands all summer, has had a long, lovely winter’s nap. But now it’s time to wake that sucker up. What the Heck is Lawn Aeration Anyway? To put it simply, aeration is poking hundreds of tiny holes in your lawn, and pulling out tiny tubes of thatch, called plugs. You have to do this because, over time, the soil beneath the grass becomes compacted. This occurs from normal foot traffic, lawn mowing and watering. Eventually, the dirt becomes so compacted that critical moisture and air can’t circulate down to the roots of the turf. And without air and drainage, your grass struggles mightily, opening the door for weeds, pests and unsightly brown or bare spots. Not only will aerating your lawn boost the health and beauty of your grass, but it will also help you save water – and money! When oxygen and moisture flow through the soil, the turf roots can access naturally occurring nutrients and fertilizers, requiring less frequent watering and less use of chemical fertilizers. And aerating helps remove some of the dense thatch layer that builds up at the soil line, which can also choke out your grass. Basically, aeration is a simple and inexpensive way to ensure that your lawn is the envy of the neighborhood! Do I Have to Aerate Every Year? Yes, you do need to aerate every year. Sometimes twice, depending on the type of grass you grow. It’s the pre-spring aeration that’s most important, but you may want to repeat the process in the fall as well if your soil is prone to compaction. That requires a plug-type aerator. After soaking the soil thoroughly, you must painstakingly go inch by inch, poking holes like a madman with an awl. The smart bet is to hire a landscape contractor that can handle this tedious job for you. That way you can kick back and watch a baseball game or take your kids to the park. If you don’t have a landscaper you trust, give us a call and we can recommend someone awesome to make it happen. The Dirt Bag is based in West Jordan, Utah, but we serve customers throughout Salt Lake County and all along the Wasatch Front. We offer a large variety of bulk landscaping materials, including compost, bark mulch, topsoil, decorative rock, cobble and organic garden soil. We deliver your Utah landscape products right to your door, in a handy reusable and resealable woven bag. No more driving to the home warehouse and lugging your dirt, rock or mulch. Give us a call today to schedule your delivery! Don’t forget, it’s almost sod season in northern Utah, so don’t put off those all-important lawn aeration services!